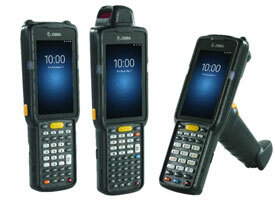 The Zebra MC3300 Android Mobile Barcode Computer is the next generation of the highly successful MC3000 series offering a faster processor, more memory options, new scanner options and the latest Android 7.0 Nougat OS for the enterprise. The MC3300 comes in the 3 different form factors you are used to with a gun configuration, brick configuration and rotating head configuration along with the familiar keypads you are used to on your existing MC3000 series devices. The MC3300 is also backwards compatible with some of your existing MC3200 accessories including batteries, cradles (With Adapter) and holsters. 4.0" Screen, SE965 1D Laser, 802.11 a/b/g/n/ac/d/h/i/k/r/w, Bluetooth 4.1, No Camera, 2GB RAM / 16GB Flash, 29 Key Keypad, 5200 mAh Battery, Android 7.0 Nougat Non-GMS OS. 4.0" Screen, SE965 1D Laser, 802.11 a/b/g/n/ac/d/h/i/k/r/w, Bluetooth 4.1, No Camera, 2GB RAM / 16GB Flash, 38 Key Keypad, 5200 mAh Battery, Android 7.0 Nougat Non-GMS OS. 4.0" Screen, SE965 1D Laser, 802.11 a/b/g/n/ac/d/h/i/k/r/w, Bluetooth 4.1, No Camera, 2GB RAM / 16GB Flash, 47 Key Keypad, No Battery, Android 7.0 Nougat Non-GMS OS. 4.0" Screen, SE965 1D Laser, 802.11 a/b/g/n/ac/d/h/i/k/r/w, Bluetooth 4.1, No Camera, 2GB RAM / 16GB Flash, 47 Key Keypad, 5200 mAh Battery, Android 7.0 Nougat Non-GMS OS. 4.0" Screen, SE4750-SR Std Range 1D/2D Imager, 802.11 a/b/g/n/ac/d/h/i/k/r/w, Bluetooth 4.1, No Camera, 2GB RAM / 16GB Flash, 29 Key Keypad, 5200 mAh Battery, Android 7.0 Nougat Non-GMS OS. 4.0" Screen, SE4750-SR Std Range 1D/2D Imager, 802.11 a/b/g/n/ac/d/h/i/k/r/w, Bluetooth 4.1, No Camera, 2GB RAM / 16GB Flash, 38 Key Keypad, 5200 mAh Battery, Android 7.0 Nougat Non-GMS OS. 4.0" Screen, SE4750-SR Std Range 1D/2D Imager, 802.11 a/b/g/n/ac/d/h/i/k/r/w, Bluetooth 4.1, No Camera, 2GB RAM / 16GB Flash, 47 Key Keypad, No Battery, Android 7.0 Nougat Non-GMS OS. 4.0" Screen, SE4750-SR Std Range 1D/2D Imager, 802.11 a/b/g/n/ac/d/h/i/k/r/w, Bluetooth 4.1, No Camera, 2GB RAM / 16GB Flash, 47 Key Keypad, 5200 mAh Battery, Android 7.0 Nougat Non-GMS OS. 4.0" Screen, SE4750-SR Std Range 1D/2D Imager, 802.11 a/b/g/n/ac/d/h/i/k/r/w, Bluetooth 4.1, No Camera, 2GB RAM / 16GB Flash, 47 Key Keypad, 5200 mAh Battery, Android 7.0 Nougat GMS OS. 4.0" Screen, SE965 1D Laser, 802.11 a/b/g/n/ac/d/h/i/k/r/w, Bluetooth 4.1, No Camera, 4GB RAM / 16GB Flash, 47 Key Keypad, 5200 mAh Battery, Android 7.0 Nougat Non-GMS OS. 4.0" Screen, SE4750-SR Std Range 1D/2D Imager, 802.11 a/b/g/n/ac/d/h/i/k/r/w, Bluetooth 4.1, No Camera, 4GB RAM / 16GB Flash, 38 Key Keypad, 5200 mAh Battery, Android 7.0 Nougat Non-GMS OS. 4.0" Screen, SE4750-SR Std Range 1D/2D Imager, 802.11 a/b/g/n/ac/d/h/i/k/r/w, Bluetooth 4.1, No Camera, 4GB RAM / 16GB Flash, 47 Key Keypad, 5200 mAh Battery, Android 7.0 Nougat Non-GMS OS. 4.0" Screen, SE4750-SR Std Range 1D/2D Imager, 802.11 a/b/g/n/ac/d/h/i/k/r/w, Bluetooth 4.1, No Camera, 4GB RAM / 16GB Flash, 47 Key Keypad, 5200 mAh Battery, Android 7.0 Nougat GMS OS. 4.0" Screen, SE4850 Long Range 1D/2D Imager, 802.11 a/b/g/n/ac/d/h/i/k/r/w, Bluetooth 4.1, No Camera, 4GB RAM / 16GB Flash, 38 Key Keypad, 5200 mAh Battery, Android 7.0 Nougat Non-GMS OS. 4.0" Screen, SE4850 Long Range 1D/2D Imager, 802.11 a/b/g/n/ac/d/h/i/k/r/w, Bluetooth 4.1, No Camera, 4GB RAM / 16GB Flash, 47 Key Keypad, 5200 mAh Battery, Android 7.0 Nougat Non-GMS OS. 4.0" Screen, SE965 1D Laser, 802.11 a/b/g/n/ac/d/h/i/k/r/w, Bluetooth 4.1, No Camera, 4GB RAM / 32GB Flash, 47 Key Keypad, 5200 mAh Battery, Android 7.0 Nougat Non-GMS OS. 4.0" Screen, SE4750-SR Std Range 1D/2D Imager, 802.11 a/b/g/n/ac/d/h/i/k/r/w, Bluetooth 4.1, No Camera, 4GB RAM / 32GB Flash, 47 Key Keypad, 5200 mAh Battery, Android 7.0 Nougat Non-GMS OS. 4.0" Screen, SE4750-SR Std Range 1D/2D Imager, 802.11 a/b/g/n/ac/d/h/i/k/r/w, Bluetooth 4.1, No Camera, 4GB RAM / 32GB Flash, 47 Key Keypad, 5200 mAh Battery, Android 7.0 Nougat GMS OS. 4.0" Screen, SE4850 Long Range 1D/2D Imager, 802.11 a/b/g/n/ac/d/h/i/k/r/w, Bluetooth 4.1, No Camera, 4GB RAM / 32GB Flash, 47 Key Keypad, 5200 mAh Battery, Android 7.0 Nougat Non-GMS OS. 4.0" Screen, SE965 1D Laser, 802.11 a/b/g/n/ac/d/h/i/k/r/w, Bluetooth 4.1, No Camera, 2GB RAM / 16GB Flash, 38 Key Keypad, 2700 mAh Battery, Android 7.0 Nougat Non-GMS OS. 4.0" Screen, SE965 1D Laser, 802.11 a/b/g/n/ac/d/h/i/k/r/w, Bluetooth 4.1, No Camera, 2GB RAM / 16GB Flash, 38 Key Keypad, 2700 mAh Battery, Android 7.0 Nougat GMS OS. 4.0" Screen, SE965 1D Laser, 802.11 a/b/g/n/ac/d/h/i/k/r/w, Bluetooth 4.1, No Camera, 2GB RAM / 16GB Flash, 29 Key Keypad, 2700 mAh Battery, Android 7.0 Nougat Non-GMS OS. 4.0" Screen, SE965 1D Laser, 802.11 a/b/g/n/ac/d/h/i/k/r/w, Bluetooth 4.1, No Camera, 2GB RAM / 16GB Flash, 29 Key Keypad, 2700 mAh Battery, Android 7.0 Nougat GMS OS. 4.0" Screen, SE965 1D Laser, 802.11 a/b/g/n/ac/d/h/i/k/r/w, Bluetooth 4.1, No Camera, 2GB RAM / 16GB Flash, 47 Key Keypad, 2700 mAh Battery, Android 7.0 Nougat Non-GMS OS. 4.0" Screen, SE965 1D Laser, 802.11 a/b/g/n/ac/d/h/i/k/r/w, Bluetooth 4.1, No Camera, 2GB RAM / 16GB Flash, 47 Key Keypad, 2700 mAh Battery, Android 7.0 Nougat GMS OS. 4.0" Screen, SE965 1D Laser, 802.11 a/b/g/n/ac/d/h/i/k/r/w, Bluetooth 4.1, No Camera, 2GB RAM / 16GB Flash, 38 Key Keypad, 5200 mAh Battery, Android 7.0 Nougat GMS OS. 4.0" Screen, SE965 1D Laser, 802.11 a/b/g/n/ac/d/h/i/k/r/w, Bluetooth 4.1, No Camera, 2GB RAM / 16GB Flash, 47 Key Keypad, 5200 mAh Battery, Android 7.0 Nougat GMS OS. 4.0" Screen, SE4750-SR Std Range 1D/2D Imager, 802.11 a/b/g/n/ac/d/h/i/k/r/w, Bluetooth 4.1, No Camera, 2GB RAM / 16GB Flash, 38 Key Keypad, 5200 mAh Battery, Android 7.0 Nougat GMS OS. 4.0" Screen, SE965 1D Laser, 802.11 a/b/g/n/ac/d/h/i/k/r/w, Bluetooth 4.1, No Camera, 4GB RAM / 16GB Flash, 47 Key Keypad, 5200 mAh Battery, Android 7.0 Nougat GMS OS. 4.0" Screen, SE4750-SR Std Range 1D/2D Imager, 802.11 a/b/g/n/ac/d/h/i/k/r/w, Bluetooth 4.1, No Camera, 4GB RAM / 16GB Flash, 38 Key Keypad, 5200 mAh Battery, Android 7.0 Nougat GMS OS. 4.0" Screen, SE4850 Long Range 1D/2D Imager, 802.11 a/b/g/n/ac/d/h/i/k/r/w, Bluetooth 4.1, No Camera, 4GB RAM / 16GB Flash, 47 Key Keypad, 5200 mAh Battery, Android 7.0 Nougat GMS OS.